The use of outdoor wood furnaces for heating is gaining new popularity with plentiful wood supplies and its cost effectiveness, low impact on the environment and the advent to safe, convenient, and long lasting stainless steel outdoor wood furnaces. 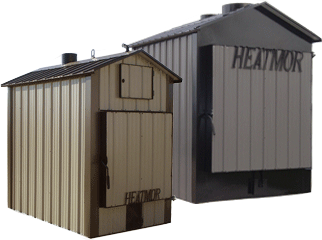 Special Financing Now Available for Outdoor Wood Furnace Purchases! Heavy Gauge STAINLESS STEEL is used in all assemblies that come in contact with fire and water. This protects against corrosion and warpage and will increase the life of your furnace. ASH AUGER CHAMBER and CAST IRON GRATES in the firebox provide efficient combustion that burns wood into a fine power, providing for easy removal of ashes without a shovel. SEMI-CLOSED LOOP SYSTEM reduces evaporation of water and/or anti-freeze. MULTIPLE HOOK-UPS allow you to heat more than one building/heating system from the same furnace, including your home, domestic hot water, swimming pool, hot tub, garage, workshop, green house, or farm shop. No mess, smoke or fire danger in home. No need to split or haul wood into home. Works with existing forced air, hot water, or radiant floor heating systems. Many different APPLICATIONS from home to workshop and everywhere in between. 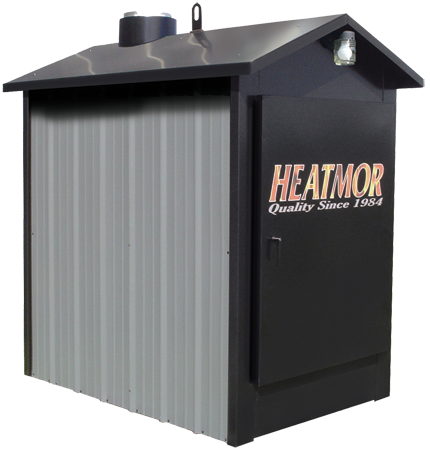 You realize big savings with your HEATMOR™ furnace, designed to work as easily with existing heating systems as with new construction. The more heating needs you have, the greater the savings, because a HEATMOR™ system can add warmth to your life inside and out. The HeatmorTM X-Series Model 200X and 350X was designed to meet the emission limits set forth in the EPA new source performance standard, while still maintaining the HeatmorTM quality design customers know and trust. Color Options – 22 colors are available. Exact color samples can be supplied by Mikes Heating upon request. Shaker Grate Option – The HeatmorTM residential models are capable of burning certified types of coal. By adding the Shaker Grate Option to your Heatmor Outdoor Furnace, you will easily be able to burn coal as well as cord wood in the same unit. For more information, please contact Mikes Heating. 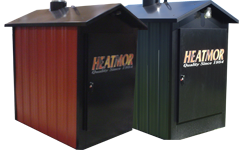 Quality – As the outdoor wood furnace industry’s innovator in the use of stainless steel, HEATMOR™, Inc. can offer the finest in quality and craftsmanship and back it with the best warranty available. The new Models 600 CSS and 800 CSS are constructed with the same 409 grade stainless steel furnaces and have been outperforming mild steel three to one (lasting up to three times longer). To provide the strength and durability in these larger models, we have utilized a heavier gauge of stainless steel (7 gauge) to endure the rigors of commercial applications. Applications – The need to heat large commercial-type buildings and to utilize waste wood as an energy resource are the reasons for the development of these units. The 800 CSS model is capable of handling the heating needs of any building up to 25,000 sq. ft. (18,000 sq. ft. for the 600 CSS). Convert your waste wood into heat for your business while reducing heating costs and landfill fee for disposal.